`Head and shoulders above almost all other new books about China, this unflinching and yearningly compassionate portrait of the lives and loves of ordinary Chinese workers is quite unforgettable' Simon Winchester Every year in China millions of migrant workers leave their rural towns to find jobs in the cities. These people are the driving forces behind China's economic boom: they work very hard and for little money to make the trainers, ornaments, designer handbags and toys which we buy. 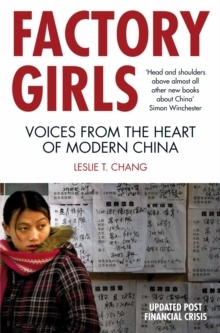 Through the lives of two young women, Chang vividly portrays a world where you can lose your boyfriend and your friends with the loss of a cell phone; where lying about your age, your education, and your work experience is often a requisite for getting ahead; where a few computer or English lessons can catapult you into a completely different social class.